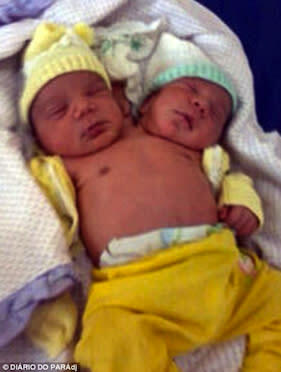 A Brazilian woman has given birth to a two-headed baby boy and doctors say the newborn appears to be in good health. Maria de Nazare has decided to name the pair, who share a heart, lungs, liver and pelvis, Emanoel and Jesus. "When doctors scanned her they realized that the baby had two heads and that a normal birth would be a great risk both for mother and baby," hospital director Claudionor Assis de Vasconcelos told Brazil's O Povo newspaper. "The caesarean took an hour because the baby was sitting down." "Despite all the problems we have as a small interior hospital we managed to save both mother and baby, which was our aim," he said. "And for us it was a great surprise to find out that the child was in really good health." De Nazare was expecting twins and only found out about the two-headed child minutes before doctors advised her to have a caesarean birth in order to save both her life and that of her baby. Along with two heads, the 9.9 pound newborns have separate spines. In some two-headed births where one brain is less developed, one head is removed in order to save the child's life. But rarer cases like this one, where there are two functioning brains, complicates the decision making process for doctors. "If both their brains are functioning, how are we going to choose which head to remove?" said Neila Dahas, director of the Santa Casa hospital. "We are not considering the possibility of surgery. What we've got to think about at this moment is to maintain the children in good condition and see how they will develop." Conjoined twins sharing a body, but with separate heads, are extremely rare but not without precedent. This is the second such birth in Brazil this year. However, the other child died after a few hours because of a lack of oxygen to one of the child's heads. There have been at least 14 dicephalic conjoined twins born over the past 200 years. In the United States, 21-year-old Abigail and Brittany Hensel were the subject of a 1996 documentary from The Learning Channel and appeared on the Oprah Winfrey Show. • Did the military haul a UFO through Kansas?